Billboard Signs. LJMDesign Provides Quality Printing, Signs and Websites. Cairns and Townsville North Queensland. LJMDesign can help you with your next billboard project. 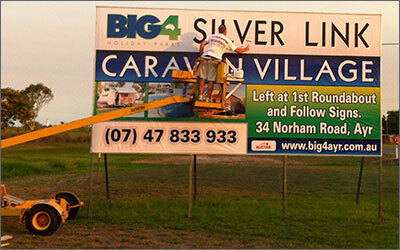 These can be huge signs that create huge impact to passing traffic! Options can include design and supply of banner skins for existing billboard frames, or we can start from scratch and construct the billboard frame from the ground up! ➜ Quality materials are important for strength against harsh weather.